Enjoy comfortable elegance in this RECENTLY UPDATED Argyle country estate home with 4 large bedrooms, 3.5 bathrooms, two remarkable 1st floor living areas--all overlooking the loveliest views in Argyle! 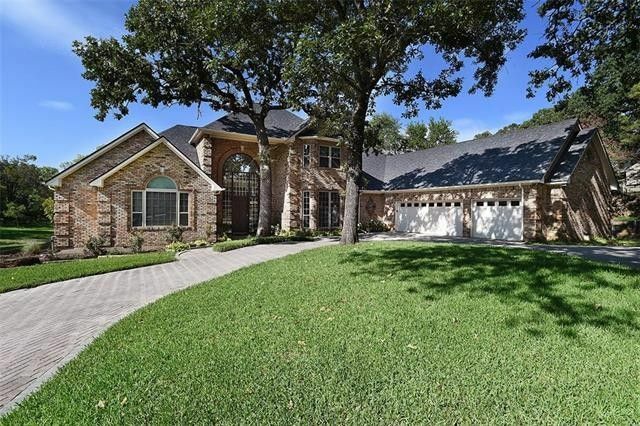 3.54 rolling acres of lush greenbelt & mature oaks surround this dramatically designed builder's personal home. 1ST FLOOR UPDATED SECLUDED Master Ste & Guest Ste with private full bath! UPDATED kitchen offers ample custom oak cabinets, stainless appliances, granite counters, island, 2 sinks, butler's pantry & breakfast bar--opening to a sun-lighted family room-breakfast area with stunning wood floors, 2nd fireplace, wine bar, French doors to BIG patios! 16ft. diningroom could be grand study! 37x24 3-CAR GARAGE! Directions: From Denton I-35, take Hwy 377 South to Argyle, take Hickory Hill Rd. to the left. The home is on the left.